The Marietas Islands continue to cause a stir around the world: this time Condé Nast Traveler included them in two posts on exceptional places. One was an entire article dedicated to the islands and the other placed them among the 13 most curious destinations in Mexico. Condé Nast Traveler, one of the world’s top tourism publications, spotlighted the Riviera Nayarit’s Marietas Islands twice. There’s no doubt these beautiful islets continue to cause a stir around the world. 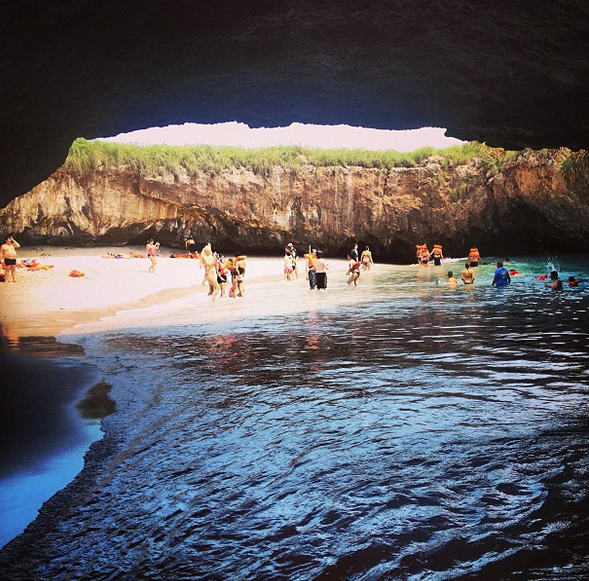 In the same section of the “101 Incredible Places” there’s another article called “13 Unusual Spots in Mexico You Might Not Know Even Existed.” The Playa Escondida, or Hidden Beach, appears in second place on this list of amazing places. “This beach (called the Hidden Beach) is one of the attractions that lure hundreds of visitors each week to the Marietas Islands. These small, uninhabited but protected islets are located across the coast of Punta de Mita, in Nayarit, and can only be reached via authorized tours,” he describes. Condé Nast Traveler has a vast collection of different formats and regions where it distributes its content, including magazines printed in Europe and the Americas, websites and social media platforms; together, they add up to hundreds of thousands of impressions for the Riviera Nayarit. The two articles have caught the attention of other domestic and international media representatives, including Mexico’s opinion leader Carmen Aristegui, who replicated the information. It’s important to note what Condé Nast writes about the Marietas Islands regarding its status as a Biosphere Reserve by recommending visitors access them only via authorized tours.